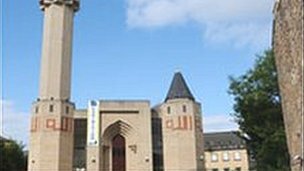 A man who threw bacon into an Edinburgh mosque has been jailed for 10 months. Wayne Stilwell, 25, was caught on security cameras attaching the bacon to the handles of the main door at Edinburgh’s Central Mosque. He then threw the bacon inside the building, knowing Muslims regard pork as unclean. At Edinburgh Sheriff Court earlier he pled guilty to causing a breach of the peace. His lawyer said Stilwell was sorry for his crime. Sheriff Gordon Liddle said his actions had been “grossly offensive” and jailed him for 10 months. The city’s sheriff court heard that Islam prohibits its followers from consuming products made of pork – and Stilwell’s actions, on 31 January 2013, offended people at the mosque. Sentence had been deferred on Stilwell, a prisoner of HMP Edinburgh, for background reports. On Tuesday, defence solicitor Matthew Nicholson told the court his client was sorry for his crime and accepted that he would be going to prison.